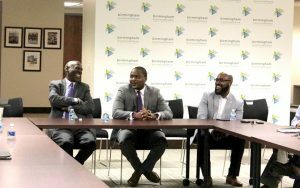 Geoffrey Canada, educator, social activist and author, recently led a discussion at the Birmingham Business Alliance (BBA) on his life-long passion of creating better educational opportunities for students in poverty. Canada was visiting Birmingham from New York to speak at the Growing Kings annual luncheon last week and held a follow-up discussion at the BBA. Geoffrey Canada speaking with business leaders from around Birmingham. From 1990 to 2014, Canada served as the President and Chief Executive Officer for the Harlem Children’s Zone (HCZ), a nonprofit organization for children and families experiencing poverty living in Harlem that provides parenting workshops, a pre-school program, three charter schools and health programs. The Harlem Children’s Zone has been featured on The Oprah Winfrey Show, 60 Minutes and Anderson Cooper 360°. Canada spoke to a group of approximately 30 individuals from the business and education communities at the BBA and shared the goals, successes and challenges of charter schools in the Harlem community. “I am unapologetic and relentless on getting good education for underprivileged youth,” he said. Canada also reflected on the hardships he faced when implementing the HCZ program and how he overcame this adversity. The success of the HCZ program has motivated other cities like Chicago, Philadelphia, Miami and Cleveland to enact or consider similar programs. 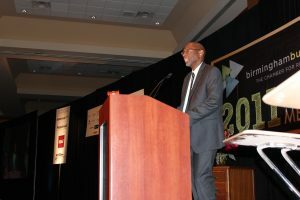 Geoffrey Canada at the 2011 BBA Annual Meeting. In 2015, Alabama Governor Robert Bentley signed into law a bill allowing charter schools to operate in the state. Canada visited Birmingham in 2011 to speak at the BBA’s annual meeting, where he shared his message with more than a thousand business leaders. To learn more about the Harlem Children’s Zone and Geoffrey Canada, visit http://hcz.org/about-us/.